Using the Matrix function of PointClickCare’s electronic health records system was a gamechanger for Lori Coday, director of nursing at Granite Creek Health and Rehab in Prescott City, AZ. Her efforts helped land the facility the Gold Award in the Survey category of the McKnight’s Technology Awards (Skilled Nursing Division). Coday told McKnight’s that previously she had used an Excel spreadsheet for the facility resident matrix, which is needed for surveyors. But it was a challenge to update and add or remove residents. Once she started using the PCC Matrix function, it became much more simple, she said. She was able to hand surveyors the matrix when they walked in the door. “PointClickCare is always innovative and up-to-date,” she said. “That’s what the surveyors needed in up-to-the-minute documentation. It helps us be transparent.” The result was a perfect survey. 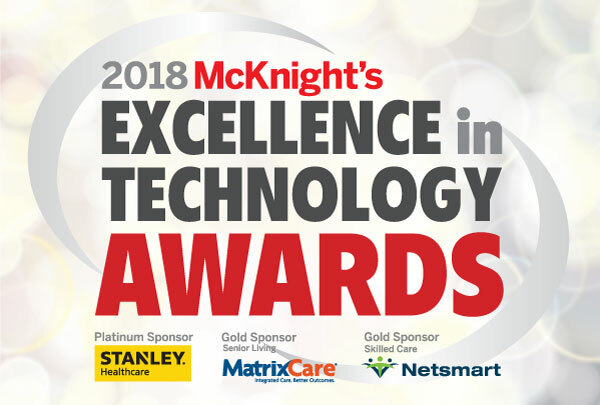 Also winning Gold in the McKnight’s Tech Award was Foundations Health Solutions in Warren, OH, in the Admissions category. Foundations began using Hyland’s OnBase system to improve its admissions process. It found the increased automation eliminated 41 manual steps for staff, and that OnBase helped identifying missing documents. The admissions process has improved by 50% for associated tasks, says Chief Operating Officer James Homa. Foundations Director of Admissions Monica Dewitt told McKnight’s the automation eliminated a lot of manual copying and approvals. -Capitol Hill Healthcare in Montgomery, AL, won Silver for its use of The Compliance Store in customizing its research needs. The site is used as a quick reference for F-tags during the survey. The facility also uses the site’s tools such as its QAPI template. – Good Samaritan Society, based in Sioux Falls, SD, won Bronze in demonstrating how its use of the Direct Supply TELS program increased its ability to be prepared for its survey. – Encore Health and Rehabilitation in Crowley, LA, won Silver for its use of It’s Never 2 Late to help residents transition from home to the community. IN2L helps staff find activities and interests suitable for a resident’s personality, staff said. – Bronze winner Shannon Medical Center in San Angelo, TX, began using the PeraHealth’s Rothman Index to establish if a patient in the hospital is ready for skilled care. After the patient is transitioned to skilled care, the Rothman Index is continued as a way to establish readiness for discharge. Click here to read about Monday’s winners.